Saturday saw three of AO Mastodon’s PAX awaiting their Q in the brisk wind. After hitting the standard warm-up on their own, one resourceful PAX (Banks) decided today was a good time to break out the F3 Workout Deck they had purchased for just such an emergency. We Moseyed to the pavilion and proceeded to randomize our beat-down. After lucking out on the Ace pulls (for exercise, not reps) and turbo-ing through some cardio and ab workouts, some guy Q-drenalined his way into more bear-crawl than he could handle. Overall a good day and a well-rounded workout. Shout out to Archive for making it back to fighting shape after this week’s maladies. COR/NOR/COT: Health, good spirits and recovery for 2/3 houses. Good, close relationships at home and hearts of service and personal courage. Backblast, or it didn’t happen! 2.14.19 – Happy Cardio Day! Thursday saw our Q once again whole minutes behind schedule. Thankfully the PAX already there saw him roll up before beginning a run around the park, and normal order resumed shortly after. Eager to try out his new idea on a human test subject, they settled in for a cardio heavy Valentine’s Day as the ice rained down from the trees. NOR/COR/COT: Lifting up the business of life (home and work), and the weariness in the Crunch household. Prayer for a spirit of charity and encouragement to cover all. Potential idea: The “Indy 5000” (an Indy 500 involving at least 3.1mi/5km). Named to scare people who have survived an “Indy 500” routine. With the Q rising in the gloom about 5 min before start time at AO Mastodon, the urge to fartsack was real. But fear of failing a posting PAX was once again the antidote to laziness. Hiking on the ruck and hurrying out the door, a 5-min late arrival let no one down but himself. Schrödinger’s PAX had already served his purpose, however, and with the momentum of his arrival, the Q kept rolling around the park. With no one to tell him how dumb his idea was, the first “Indy 500” was birthed. New Routine: Indy 500 – Define a loop (between .25mi and 2mi). Name an exercise. Run the loop, doing sets of the exercise at intervals. 500 reps or AMRAP until time. 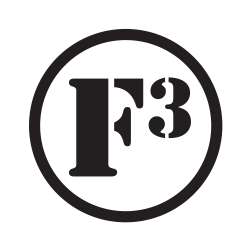 NOR/COR/COT: Prayers for the unity and endurance of the F3 Wheaton team as they outlast the winter. Prayers for FNGs and those members who have been far afield this year. While F3 Naperville was mid-Convergence, Wheaton’s AO Mastodon crew went with a divide-and-conquer strategy. With Banks planning to make the trip down to Dark Tower and Archive and Avon holding down the home fronts, it fell to Capt. Crunch to keep the fire burning at Northside. With the ground too cold for the shovel flag to break through, it was braced against the fence on the hill-top, 9/11 style (minus any NYFD). Nothing left but to ascend the hill a 2.5 dozen times and light the beacons! NOR/COR/COT: Prayers for the brothers converging, for the homes and communities that they shepherd and serve. Prayers for men to hear the voice in the wilderness and answer the call, however crazy. Thought of the Day: Big commits are typically just a long string of small commits. A slight mistiness to the air and a slow wake up saw our lone Q rushing to the park on a Thursday morning. He planted the flag a few minutes behind schedule, and realized his opportunity for a guilt-free overdose of stupid stuff. He rolled the (metaphorical) Dice of Discomfort and they came up Murph. After some standard warm-ups, he began the run. NOR/COR/COT: prayers for the brothers, both at this AO and in the greater region and F3 nation; health in body, mind, and soul and a closeness with family and friends over the holidays. Prayers that the harvest would grow this year.